The right to U.S. citizenship for children born on American soil is being challenged, again. On Sunday, Republican presidential candidate Donald Trump released a series of immigration proposals, including bringing an end to birthright citizenship. This statement in particular is receiving extraordinary media attention — even as a policy idea that’s been dredged up time and again through the years, largely to stir up anti-immigrant sentiment. For Asian Americans, this is hardly a new issue, and the inflammatory xenophobic language that comprises so many arguments to end birthright citizenship are painfully familiar. After all, the person who brought the question of his citizenship to the Supreme Court in 1897 was Asian American, born in San Francisco to Chinese immigrant parents. Professor Erika Lee, director of the Immigration History Research Center at the University of Minnesota and author of the book “The Making of Asian America: A History” offers up a short lesson in the New York Daily News this week, telling the story of Wong Kim Ark, the 24-year-old who insisted he was a U.S. citizen based on his birth as granted by the Fourteenth Amendment. While this claim seems straightforward today, it was extraordinary for its time. 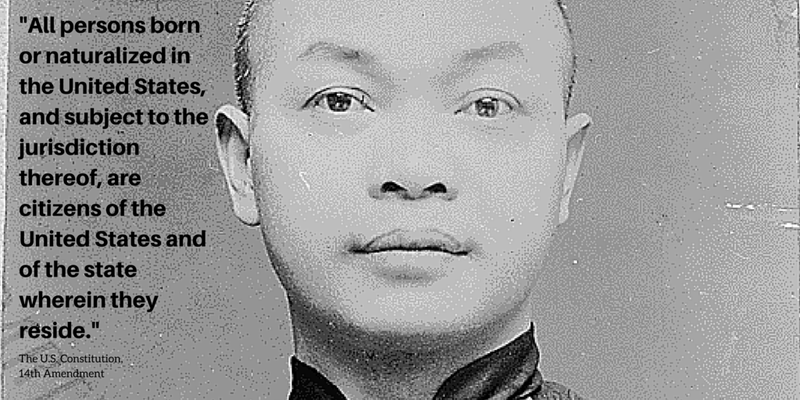 The Chinese Exclusion Act, the first significant legislation passed to keep a specific ethnic group from entering the country and naturalizing, was in effect, and the U.S. government argued that Wong Kim Ark could not be a U.S. citizen because his parents were not and could not become U.S. citizens. The Supreme Court ruled in favor of Wong Kim Ark. At a time when sentiment against Chinese immigrants was high, this decision in favor of a Chinese-American born on American soil set the precedent that children born in the United States, even to parents not eligible to become citizens, were nonetheless citizens themselves under the 14th Amendment of the U.S. Constitution. This precedent has endured for over 100 years. The history of the Citizenship Clause contained within the Fourteenth Amendment is itself embedded in our country’s attempts to right its wrongs and create a better union. The language of the amendment, which reads, “All persons born or naturalized in the United States, and subject to the jurisdiction thereof, are citizens of the United States and of the state wherein they reside,” was crafted in response to the infamous Dred Scott decision, which held that African Americans, whether enslaved or free, could not be American citizens. As a constitutionally guaranteed right, the only way to end birthright citizenship would be to change the Citizenship Clause by amending the U.S. Constitution. And that change could not solely affect one class of people — it would require every parent to prove his or her citizenship, inviting government, bureaucracy, and other unwanted intrusions into the lives of all U.S. citizens. Attempts to end birthright citizenship are unrealistic and impractical for all Americans. While dusting off issues like ending birthright citizenship may serve to incite anti-immigrant passions for political gain, all Americans will be much better served when our representatives focus their energies on finding real solutions to our complex immigration needs and pass true immigration reform. Obsessively in pursuit of joy via social justice, dancing, painting, fishing. Outreach Manager @Public_Justice. Opinions my own. Working to empower Asian Americans and Pacific Islanders to participate in our democracy and fighting for civil and human rights for all.